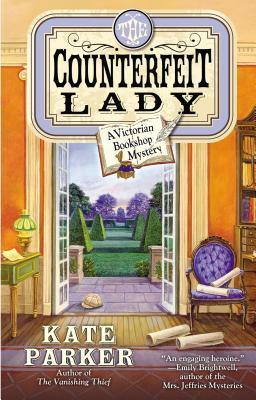 The Counterfeit Lady by Kate Parker is the second in the Victorian Bookshop Mystery series, and the sequel to A Vanishing Thief. Georgia Fenchurch is an antiquarian bookseller in London, and is also a member of the Archivist Society, a group that investigates matters brought to them by concerned parties. In the course of the first book Georgia made more than a passing acquaintance with the Duke of Blackford, who had an interest of his own in the case she was pursuing. This time, Blackford reappears and requests Georgia's assistance with another case- this time involving Britain's national security. This case has a personal stake for Georgia as well. A woman has been murdered- and the woman is a relative of Phyllida Monthalf, who is a friend of Georgia's and was herself rescued by the Archivist Society years ago. Georgia promises they will get to the bottom of the murder, but it is a race against time as the murdered woman's husband is a ship designer- and some crucial plans have gone missing. The husband is the prime suspect, but Blackford suspects foreign spies are at work, trying to get a copy of the highly sensitive plans. Blackford decides that Georgia must impersonate a high society lady to gain access to the gossip and secrets that are swirling around the case... and not only that, she must pretend to be his paramour as well. Georgia would like nothing more than to spend time with the duke- but when it becomes clear that someone knows her true identity and will stop at nothing to obtain the plans, Georgia must decide how far she will go to find the killer... but will her own heart be broken in the process? This book is just a lot of fun. Georgia is a great heroine, and there are twists and turns galore as the plot plays out. Blackford of course seems a little too perfect but Georgia is resourceful and can take care of herself, thank you very much. They have a great relationship, full of sexual tension (but this is Victorian times so everything is kept very appropriate). My absolute favorite part of this book was the repartee between Georgia and the various nobles and titled women she comes in contact with. The dialogue and banter are the strength of this series. I think I enjoyed this one every bit as much as I did the first one, and will be looking forward to the next book. It's a long weekend! This week was good, I finished two books and got a few reviews up. Will be linking to COYER today. With autumn fast approaching I'm starting to get in the mood for those kind of reads. You know, mysteries and stuff with more of an edge to it. I'm thinking of joining the Frightfall readathon and maybe doing some things like that this year. Do your reading tastes change with the seasons? 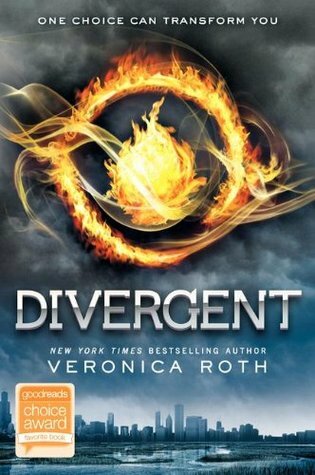 Late Night Lamplight has a nice review of Divergent. Yeah it's been reviewed a zillion times, but if I wasn't already planning on reading it, this might have convinced me. Nice blog too. Book Den has a review for And Then There Were none by Agatha Christie. I've never read this so I'm going to pick it up. And hey, Clue movie reference! 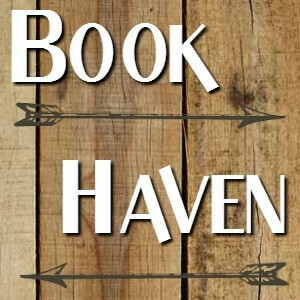 Jo at Mixed Book Bag has a review up for the new robin Hobb book Fool's Assassin. Fitz is back! I'll be reading this soon. Love that cover too. Lisa Loves Literature reviews Get Even by Gretchen McNeil. Nice review, and I'm looking forward to this one. The premise just sounds fun. Book Journey reviews The Cherry Cola Book Club. Some fun cosplay this week. A steampunk Frozen, Aquaman (Aquawoman actually- wow), and Rocketeer girl? This was a fun issue only because the Avengers were re- evaluating their membership (as they did so often) and it was always fun to see who they would pick. I liked the cover and thought some of the possible choices were intriguing. 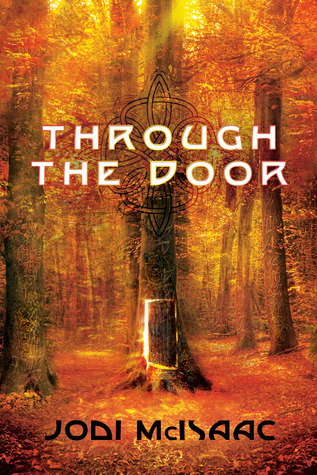 Through The Door by Jodi McIsaac is an intriguing story about a woman whose daughter can open portals to other places The story starts out with Cedar McLeod and her boyfriend Finn out at a street fair, having a good time, and Cedar is waiting for the right moment to tell him she's pregnant. Finn is acting strangely though, as if he keeps seeing someone or something in the crowd that makes him uneasy. He cuts the evening short and doesn't stay with her that night- and the next day, when Cedar goes to his place she finds him gone- without a trace. His apartment is empty and there is no sign of him anywhere. We then fast forward seven years and cedar has moved on with her life. She's a single mom, raising a daughter and trying to make ends meet. Then something happens to shake up her life- one night Cedar discovers that her daughter Eden has a very special ability. She create a portal to other places just by opening a door. They pass through a door and find themselves in Egypt, before the pyramids- and other places too, anywhere that Eden has seen, even if only on TV. Cedar is of course stunned, and begins to suspect this may have something to do with Eden's father, Finn. I thought the writing was good, very polished for a debut novel. There are some neat moments, including a cool bar that humans can't see and a thrilling battle between immortals and mermaids. About halfway through we get a POV change and we get to see the story from the perspective of the villain, which is certainly interesting. She's a nasty piece of work too! The characters are compelling and well drawn for the most part, I thought the author handled Cedar particularly well especially the emotional aspects of her journey. Cedar's actions and feelings seemed very authentic and realistic. I liked the mystery aspect of the early going, and only towards the end did I tire a bit as the story moves into the fae realm and got perhaps a bit predictable. The end is satisfying but leaves the door (sorry) open for a follow up- and in fact, books 2 and 3 are already out. 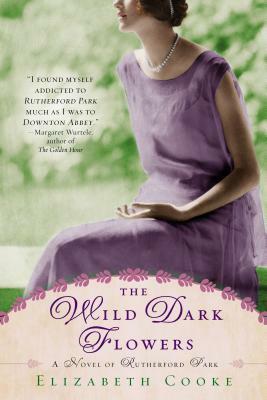 The Wild Dark Flowers by Elizabeth Cooke is the follow up to Rutherford Park, one of my favorite books of last year. It is the story of William and Octavia Cavendish, their family, and the servants at their great country estate- set against the backdrop of World War I. William is still coming to grips with the fact that his wife is in love with another man, and Octavia remains at Rutherford only for the sake of the children. Their son Harry is with the Royal Flying Corps in France, but he has seen the reality of war and no loner views it in a romantic light. Louisa is still recovering from her fling with a rake, and this has caused her to mature, but also has shattered her confidence. Charlotte is a free spirit and wants to live, to try new things, and like her mother is less tied to the old ways and the restrictions placed on her. William has grown in some ways since learning of his wife's affair, and yet in other ways he is the same man. Tied to tradition, not sure how to change or to open up to Octavia, he fears she will leave but doesn't know how to stop it. Octavia, for her part, is torn between loyalty to her husband, whom she respects but does not love, and the American she fell in love with the previous year. She feels stifled by Rutherford, and while she realizes she is fortunate to have her position, she wants the freedom to travel, to be free and find her own way. This is a story about the horrors of war, specifically WWI and some of the awful things that happened there, as much as it is about a country house and the family that lives there. This is both a strength and a weakness to my mind. I knew the war would play a role, as it was the backdrop in the first book as well, but I wasn't expecting it to play such a large role. I suspect this was a very personal book for the author, and I respect that, it just went in a different direction that I was expecting- I was looking for something similar to the first book, a country house drama with real events as a backdrop, and here the war kind of takes center stage and overshadowed everything else for me. This book ends on a serious cliffhanger, which I didn't see coming This plot twist didn't really work for me, it seemed too unlikely- and to top it off, the preview for the third book gives away the aftermath of the cliffhanger, so you know what happens just not the details. I found this a little annoying, and much preferred the way the first book ended- it was self contained, a sequel clearly possible but the story was complete in itself as well. The characters were not as compelling for me this time around as well. This is well written and powerful at times, but it didn't move me like the first one did. I would recommend reading Rutherford Park, and if you enjoy that novel and want to continue the story, by all means read this as well, but for me this didn't rise to the level of the first one. This week has been quiet and mostly uneventful. I've been traveling for work so I haven't been around much on the blog, but I have finished a few books and have reviews coming. I have a few Bookstore Spotlights coming up in the next few weeks as well. Labor Day weekend is coming up and we don't have any plans yet, although the Michigan Renaissance Festival is calling us. I guess it's a toss up between that or a last trip to the beach. Gen Con broke attendance records this year- over 50,000 people attended, and by all accounts the place was jam packed. As I mentioned last week, I didn't attend this year but will definitely be there next year. I have some links below with pics. I know COYER is winding down but I have a few reviews coming soon that I'm going to sneak in at the last minute. Of Dragons and Hearts reviews The Falconer. Also she has a nice post on hiking in Slovenia- with great pics. Check it out! The trial of Jean Grey is a story running through the Guardians of the Galaxy and All New X-Men titles. I am enjoying both titles so I was looking forward to this one, curious to see where they would go with it. Did it pass muster? Yes- big time. This is quite simply the best comic story I've read in a long time. The story starts off with Peter Quill (aka Star Lord) in a bar having a drink, and Gamora shows up- or someone who looks like Gamora. Turns out she's a shapeshifting bounty hunter and Star Lord is captured- looks like he's in trouble but lucky for him the bounty hunter encounters the real Gamora before she can get him off world. Gamora and fellow Guardian Angela make short work of the bounty hunter, and they regroup with the rest of the team. It is then that they discover that the Shi'Ar have decided to grab Jean grey from Earth and put her on trial for the actions of her future self. Turns out that in the past (Jean's future) she did certain things that earned her the enmity of the Shi'ar empire. However in All New X Men, the young original X Men have come forward in time to the present day- and the Shi'ar catch wind of it. The Shi'ar want to put the young Jean on trial for something her later self will do (make sense?). The Guardians hear of this and show up to help- too late. Jean is gone. They and the X Men join forces and set off for the Shi'ar to rescue Jean. Meanwhile Jean is being counseled by a Shi'ar telepath named Oracle. It becomes clear to Oracle that this Jean has no memory of the events she is on trial for, and while she is loyal to the Shi'ar, Oracle has serious questions about what they are doing. The Guardians and X Men of course show up, but they have some unexpected allies as well. The Starjammers appear- a band of interstellar pirates with an interesting link to Earth. There is a lot to like in this graphic novel. The teams mesh well, and the writer seems to be having fun with all the banter between the two groups. Brian Bendis' strength is his dialogue, and it's on full display here. There's a very cinematic quality to the story. When the Shi'ar are after the Guardians at one point Angela asks if they can get closer to the Shi'ar ship so she can engage them, and one of the X Men asks "closer?" This is a rollicking space adventure with colorful characters and a lots of humor. Star Lord here is a little, more serious than the movie version, but he has his snarky moments too. I really liked his interaction with Kitty PRyde of the X Men- they didn't really flirt per se, but there was a little something there. Those two would make an interesting couple! They address this a little at the end , and I thought it was nicely done. Hope those two get to meet again soon. If you're into the Guardians or X Men at all, or just want a fun adventure, check this out. Good stuff. 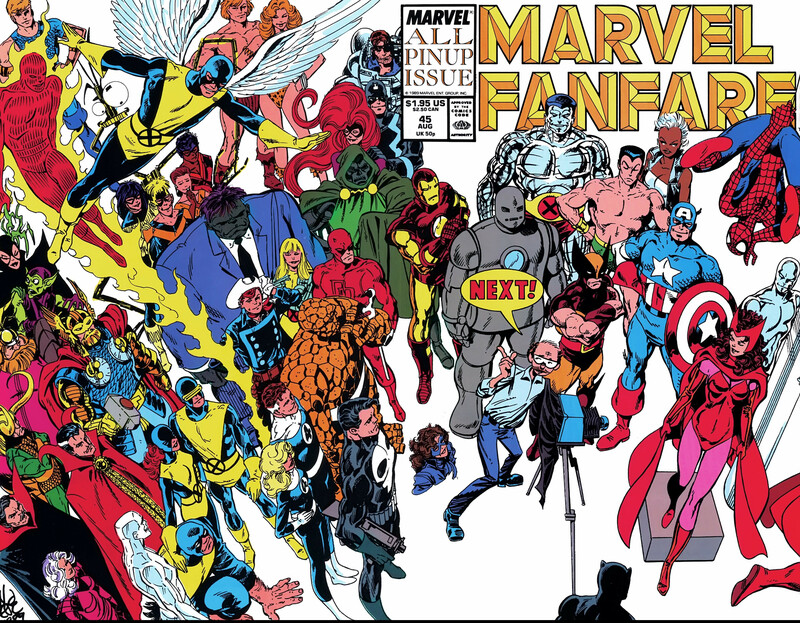 Marvel Fanfare was a glossy style publication that featured standalone stories, generally outside the continuity of the standard titles. This issue (#45) was an all artwork issue- no story, just artwork for a bunch of the Marvel characters. 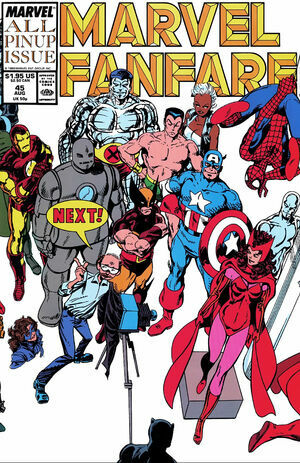 I just liked the cover- Marvel had a sense of humor back then, and it often showed up in cases like this, and Asst. Editor's Month (when the editors were supposedly all gone and the asst. editors ran wild)- stuff like that. And hey- characters smiling occasionally. This week was kinda crazy. I've read a few books in the last few weeks but the reviews are slow to go up. I did finish The Wild Dark Flowers and the review will be up later this week. I have some more Bookstore Spotlight posts coming along down the pike too The Michigan Renaissance Festival starts this weekend, and while we're not there for opening weekend, we will be soon. Looking forward to getting back! This weekend is also Gen Con, and I'm sorry to be missing it. Gen Con is the biggest convention in gaming and is always a blast. I'll be back next year for sure- but yeah I'm having a little con withdrawal, not being there. I'm a little behind on COYER, but will have some reviews up this week they are piling up a bit. Schuler Books is an independent bookstore chain with location in Grand Rapids and Lansing, MI. Schuler's is a lot like Barnes & Noble- they carry just about everything. I've been to two of their three locations and it's a very relaxing way to spend some time and explore books. They also have cafes and a music section as well. Schuler's is a great place to spend some time if you're a booklover. Not only are they very well stocked, but the stores are large, the cafes are nice and they have a good childrens section. The cafe serves sandwiches, paninis as well as the usual assortment of snacks, coffee, and all that. The cafe in Grand Rapids is nice and comfortable. Here's a link to the cafe menu. Schuler's also has an extensive used book section, and even print on demand with the Espresso Book Machine(you can read all about it here). Book club members get 20% off the club selection, and have a great variety of author events and monthly get togethers, including Italian and Japanese conversation group meetings. I've only been in one of the Lansing locations but it is nice as well. I've been to an author signing there, they have a nice little author nook. Schuler Books is locally owned and they recently acquired Nicola's Books, a well known bookstore in Ann Arbor. Iron Man #118- what can I say about this one? Tony Stark gets thrown out of the SHIELD helicarrier and has to try and don his armor before he falls to his doom. Something about rogue SHIELD agents and all that... this was from the creative team of David Michelinie and Bob Layton, who first depicted Tony Stark as an alcoholic. That would continue in later stories and even in the movies- for that and just the sheer fun of these stories I think Michelinie/ Layton have to be considered the definitive writer/ artist team. Oh, and this is from the time when Iron Man carried his armor around in his briefcase! Another week, another good but busy one. I had a guest review from my daughter and a couple of feature posts.I'm hoping to have another Bookstore Spotlight this week as long as I can get the post finished. I have to say the features have been fun and a nice change of pace. I saw the Guardians of the Galaxy movie and loved it- check out my review. Marvel hits another one out of the park. I'm ready for some more Marvel cosmic at this point. I have a COYER review or two coming up this week, need to link up and see what I've been missing on the linky. Have a great week! Guardians of the Galaxy is a movie I wanted to like, but didn't think I would. To be honest, the trailers were not a good sign for me. As a kid I have fond memories of picking up Guardians of the Galaxy comics at the party store or up north, so I was disappointed to see the movie go with the newer team. It's not the team I grew up with, so naturally I was skeptical. Well, I liked it in spite of myself. A lot. The movie starts a little slow (I thought) and seemed a little lame at first. It picks up though when they all get together on Kyln, the prison planet or whatever it was, and by the middle of the movie it's firing on all cylinders. I liked the interplay between Drax and Gamora- I still think the older version of gamora is more mysterious and dangerous, but whatever. She won me over too. I expected to hate Rocket Raccoon but ended up liking him too- go figure! Knowhere was awesome too- which brings me to the visual effects. They were great- finally a good sci fi movie with awesome visuals and a fun story. I want more movies like this- set in deep space with lots of cool ideas. The cosmic side of the MArvel Universe has always had so much potential, so many good stories- and they hit it out of the park here- something I didn't expect. This week I have a few pics to share of the Leelanau peninsula- west of Traverse City MI. The drive up along the west side of the bay is beautiful, and the area has little towns and wineries and all kinds of things to see. First- a peek of blue! Leland, MI- also known as Fishtown. A tourist village that still has some commercial fishing operations... and a legacy of historic fishing shanties that are now shops. This is a view of Glen Lake from the top of the sand dunes- notice the boats on the water (if you clickto see a larger image). Sadie is a fabulous basketball player, but when she's not on the court dribbling or making baskets, she's usually baking cupcakes for her and her friends in the PLC (Peace, Love, and Cupcakes) club. However she's struggling massively in math. Her best friend Kylie helps with her math and she rocks and wins the basketball game! Plus she gets an A- on her math test. But things go wrong when her parents start fighting a lot and she thinks they will get divorced. Then the club starts losing money when the Golden Spoon Bakery gets a hole in their roof. On top of that, there's a snow storm and all the girls- Kylie,Jenna, and Lexi- stay over at Sadie's house for the night because they can't get home! As they are watching the T.V. they see a commercial for the Battle of the Bakers. So the girls send in a video and are selected to compete! 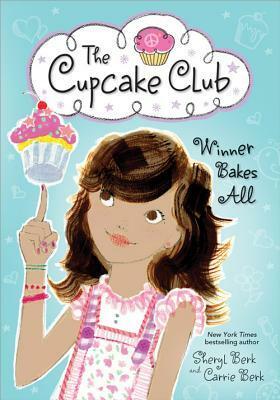 I liked this book because it showed passion, and the girls put a lot of effort into baking their cupcakes. Plus in the back of the book they have some of the recipes from the book. It is a great childrens book and I think it would most interest girls from 9-11. Also the friends help each other throughout the book and try to make other people happy with their Cupcakes! It was a very fun book to read because all the girls help each other and they did the Battle of the Bakers which gave a fun kick to it. Also A lesson learned in the book was never give up! That is one of the best lessons you can learn. It was a very fun and interesting book! Horizon Books is a full service, independent bookstore in Traverse City, MI. Located on Front St. they are in a prime location right in the heart of the shopping district, next to the historic, restored State Theater and the Grand Traverse Pie Co. Horizon has a long history in the area, having been in various different locations over the years, and have long been an anchor in the vibrant downtown area. The store has a main level as well as a downstairs cafe and coffee bar and upper level for nonfiction. They also have a small coffee kiosk on the main floor. They have a nice fireplace as well, with tables to stack your books on and read. And with great hours (open until 11:00 every night), you can spend as long as you want there. They also have tables and chairs outside, and Horizon is a prime people watching location as they're right in the middle of the action on Front St. Horizon has a regular schedule of author signings and events, and they participate in the National Writers Series which frequently brings authors to Traverse City. Horizon offers a variety of book clubs to join and a list can be found here. Horizon is a family owned store and celebrated their 50 year anniversary a couple years ago. It's one of my favorite places in Traverse City and is just a great place to spend some time. Silver Surfer #4, by Stan Lee and John Buscema. This is a classic, and expensive too- not an easy copy to obtain these days. I've always loved this cover, and the story is not bad either. Basically Loki tricks the noble Silver Surfer into fighting Thor, and they have a throwdown of epic proportions before all is revealed. This was from a time when the Surfer was a tragic, brooding but noble figure- and he had a sens of grandeur as well that is sometimes missing in later depictions. If you like comics, this is, in my opinion, one of the classics of the art form. It's an older story but holds up well- and of course the art is top notch. This week I'm sharing a few more pics from Traverse City, MI. This first one is a view from the Sleeping Bear Dunes National Lakeshore. This pic is from the tip of the Old Mission peninsula -there's a lighthouse and park here. Last year this was all dry but lake levels are up this year and so it's a lot wetter to walk all the way out there. This is a view of East Bay from the drive along the Old Mission peninsula. One of my favorite spots- the second dune and a great place to relax after the dune climb.